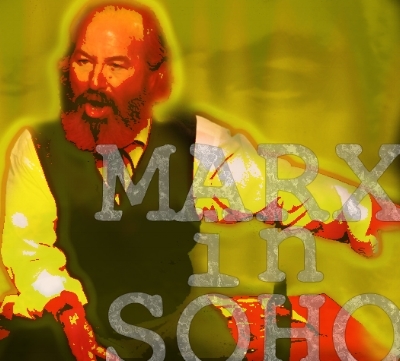 Welcome to the website of Howard Zinn's MARX IN SOHO featuring Bob Weick! It taught us more about socialism and Marx, about people and taught me more about myself. It was truly a great production. Who knew that one man, and a small table with some items on it could hold my attention for an entire hour. Nothing short of brilliant and continually engaging. GREAT PERFORMANCE, a stirring moment on campus, and a great education for the students. I highly recommend MARX IN SOHO for anyone who wants to stimulate critical thinking in a substantive and entertaining fashion. Whether you're a novice undergraduate, a Marxist scholar, a social justice advocate, or an interested citizen, you will find much of value in this production. It created a buzz on campus. I know that other faculty besides myself talked about it in their classes. People have been talking about the play and the performance in the hallways all day. What a pleasure to have Bob Weick perform Howard Zinn’s play, Marx in Soho, as the launching event for our Zinn Academic Lecture Series. What a success! Bob's incredible performance reaches into the brains of those who most need to hear Marx's message and overturns misconceptions about the man and his mission. Students were saying how it made them feel like they wanted to take action and get involved. I'm sure that it was the first time some of [the students] heard capitalism criticized. That's what I'm hoping to do with the assembly program - expand people's horizons. I will gladly recommend you to other schools and groups....What a memorable event. Your energy and intensity engaged the audience and we were hanging on to every word. What better way to learn about Marx and his ideas than from the man himself? This is teaching and learning the way it is supposed to be.